When you walk through Rome you often stop to observe a corner, a street, a detail of the city. You look around and admire the old buildings, the alleys, the large and majestic streets and you feel every place is telling you something. You wonder who has walked through the Piazzas, who has lived in the palaces, which intrigues, conspiracies were plotted in one of the many narrow streets of the centre. You wonder how the buildings were in ancient Rome, made of luxury and poverty, of great beauty and decay. Our cosy and intimate apartment represents a key to answer some of these questions! 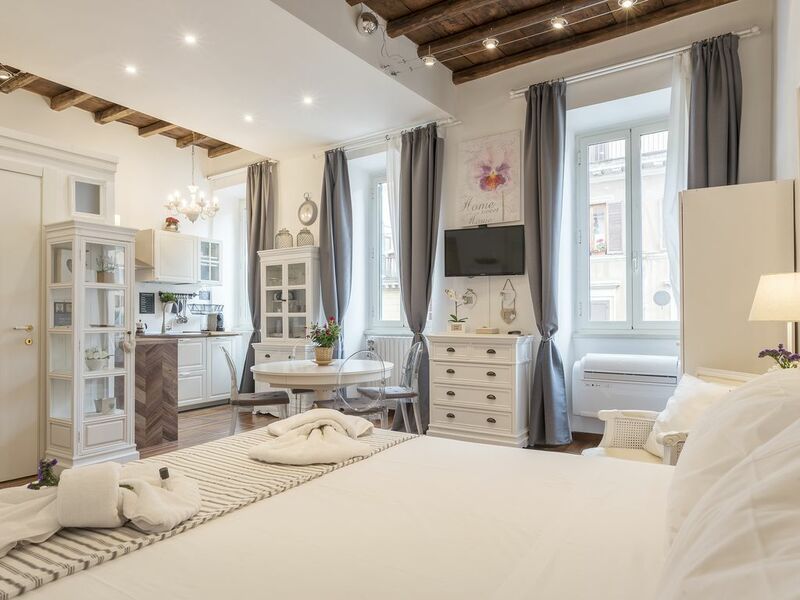 Inserted in a superb context, in the heart of Rome’s Historical Center just 1 minute from Spanish Steps and 5 minutes from Fontana Di Trevi, you will have the chance to start your journey back to the past. You will have the opportunity to lodge in an intimate and stylish apartment with 1 bedroom, 1 bathroom, a nice little kitchen, air conditioned, Wifi, NESPRESSO machine, NETFLIX (free), IPAD table-top stand, HP Deskjet 3720 printer. Capo Le Case Apartment will be the starting point of your journey through the past, the present and the future of the Ethernal City. City tax are requested in cash at the arrival. The price is 3.50 euros per person per night. Great location. Clean and comfortable. What a great apartment! Once we found our way, this place is really in a great spot. We walked to the colosseum one morning. The Spanish Steps and Trevi fountain are minutes away. We opted for a taxi to the Vatican but walked back. The apartment was very cozy for our stay. There is a cafe just down and across the street that needs to be recommended, on day 2 the barista was treating me like a local. Overall check in was very easy, the hosts offered to pick us up at the airport- I opted to take the train but should have take their ride- and check out was simple. Again, great location, great hosts, great visit to Rome. Thanks Marta!! Perfectly placed. Very comfortable. worked really well. Lovely place for a few days in Rome. Would recommend to other couples. The apartment is just as pictured. Very well-equipped, very clean. The bed was super comfortable with a memory foam mattress topper, and as well, there were two memory foam pillows and two 'regular' pillows so there were options. One suggestion would be to have a dish towel for the kitchen - there was a sponge and a scrubby thing for dishes but no towels. I have only one negative comment - the drain of the shower in the bathroom stank like sewage. There was a cap on it when I got into the shower and as such, the water could not drain (and the basin would have overflowed very quickly). So I removed the cap and that's when the smell hit. This must be simple to fix - just call a plumber to unclog the drain. The very best thing about the apartment (aside from the cleanliness and the amazing bed) is the location. It's a 2 minute walk to the Spanish Steps, 7 minutes to Trevi Fountain, and there are amazing shops all around the area. In 7-10 minutes you can be at Borghese Park for amazing sunsets and beautiful views. At the top of the street there is an art gallery. All in all, I would definitely stay here again - even if the drain wasn't fixed! we are glad that you enjoyed your stay, thanks for your review and your reporting. After your check-out, we sent our plumber to fix the problem and now we are so happy that everything works well. You are very welcome at any time! The location could not have been more perfect! It's a perfect home base for everything you want to see. The decor is absolutely charming! The communication with the host was very fast and they went over the top to get us a ride from the train station and then to the Stadium to watch a football match. It was a perfect little suite! Had everything we might have needed! We had a great stay at charme suites! Edoardo was very knowledgeable and was available if we needed him. The bed was very comfortable and there was memory foam pillows which was amazing! We will definitely return to stay here when we come back to Rome! We are located in the heart of the heart of Rome! Spanish Steps are 1 minute away and Fontana Di Trevi only 5 minutes. The apartment is therefore located in one of the top addresses of Rome historical center. We are close to the very famous shopping streets as Via Del Babuino, Via Dei Condotti, Via Della Croce and Via Borgognona. The metro Station Piazza di Spagna is just 2 minutes from the apartment. As we are in heart of Rome, the whole center is accessible just walking with no stress: Piazza Navona, The Roman Forum, The Colosseum are all located 10/15 minutes walking from us. The Vatican can be reached with many buses stopping very close or with an unforgettable walk through the old center. What more to say? We have no doubts: this is the best starting point to visit Rome!